Rousham's landscape garden should be a place of pilgrimage for students of the work of William Kent (1685-1748). Rousham represents the first phase of English landscape design and remains almost as Kent left it, one of the few gardens of this date to have escaped alteration, with many features which delighted eighteenth century visitors to Rousham still in situ, such as the ponds and cascades in Venus's Vale, the Cold Bath, and seven arched Praeneste, Townsend's Building, the Temple of the Mill, and, on the skyline, a sham ruin known as the 'Eyecatcher'. The house, built in 1635 by Sir Robert Dormer, is still in the ownership of the same family. Kent added the wings and the stable block. The south front is almost as Kent left it, but for the replacement of the octagonal glazing with plain glass. This was unfortunately carried out by the architect St. Aubyn when he added the north side of the house in 1876. Kent made alterations to the interior of the house, which retains some 17th century panelling and the original staircases, furniture, pictures and bronzes. Don't miss the walled garden with its herbaceous borders, small parterre, pigeon house and espalier apple trees. A fine herd of rare Long-Horn cattle are to be seen in the park. When you visit Rousham you will it uncommercial and unspoilt with no tea room and no shop. Bring a picnic, wear comfortable shoes and it is yours for the day. 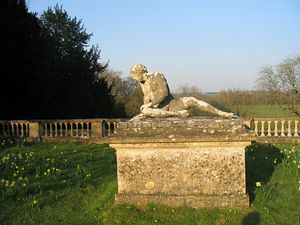 Rousham is roughly 12 miles North of Oxford and about a fifteen minute drive from junction 9 of the M40. The nearest station is Heyford (a 10-15 minute walk away), which is on the Oxford to Banbury line. Trains stop at the station roughly every two hours, Monday to Saturday, with occasional trains on Sunday during the summer months only. There is also a bus service running approximately every hour (Monday to Saturday) with a less frequent Sunday service, between Oxford and Banbury (bus numbers 59 & 59a) which passes the lodge gates at Rousham and will stop on request.